Imagine you’re on a hike or camping expedition and you suddenly find yourself lost and stranded without food, shelter or clean water. Without the right skills and equipment, a situation like this could be incredibly dangerous. There are a two things you can do however to ensure that you are equipped for handling a situation like this one. First you need to be carrying the right equipment and then you can teach yourself a few practical skills to help you along the way. To ensure you never leave the house unprepared again, Saxton Blades have brought you this survival guide with all the tools you will need for surviving in a strange place. We’ve created this guide especially for beginners to show that survival skills are something everyone can learn. 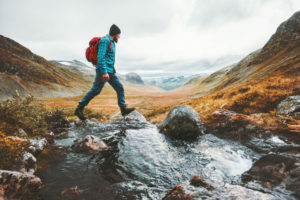 Whether you’re an outdoorsy type or not, this guide is an essential read for everyone – you simply never know when these things will come in handy! Typically, when setting off on a new expedition or trip away, you’ll want to bring a backpack of essentials with you. Typically, this might contain a water bottle, passport and money. Whilst these things are important, they won’t be much help in an emergency. There are some other things you should add in there too that will help you out in a tough situation. Most of the things we’ve included in this list shouldn’t be too expensive and can likely be found in any local electronics or camping store. Designed to be as versatile as possible, a good multi tool will have a variety of different hand tools with different functions. There are all kinds of multi tools out there so you can choose one that you think will best suit your needs. 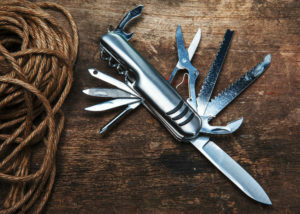 A few things you can expect to find on a multi tool include a serrated blade, scissors, a hammer, a bottle opener, a reamer and sometimes even kitchen utensils. These kinds of tools will be extremely useful for constructing shelters, cutting through thick foliage and preparing food. This is more of a pricier item, but is so useful if you can get you can get your hands on one! A GPS navigation device receives information from GPS satellites to display map and offer directions. These devices work in all weather conditions and in any location across the world – a great item for keen travellers. Navigation devices make finding your way easy and some devices can even send and receive messages like a mobile phone. If you can’t get your hands on a GPS navigation device, you’re going to need a map and a compass. There’s no point relying on your phone, since it might run out of signal or battery. A map and compass are your best option. Don’t forget to pack them! When choosing a map, remember to check its scaling as this will affect how easy it is to read. A map with a smaller scale will be more detailed, which can be easier to read than a map with large scaling. It’s a good idea to also check the shading of the map too. Shading on a map indicates the type of terrain on your route, and bad shading can make a map difficult to read. You don’t want your electronics to run out whilst you’re on the go, especially if you’re carrying a mobile phone with you! To ensure you never run out of battery, always carry a solar charger in your backpack. They’re light to carry and charge in the sun – definitely a backpack essential! A torch is an essential item for navigation. When you’re out in the wilderness, you’ll only have natural sources of light to guide you and sometimes this just isn’t enough. A hand torch and spare batteries should be one of the first things you pack before heading out. Consider packing a head torch instead if you’re planning to do any outdoor activities such as caving or mountaineering where you will need your hands free. You cannot survive without water and it’s important that the water you are drinking is clean. Water from streams or lakes can contain dangerous bacteria or chemicals, so it’s important that you purify any water you collect from natural sources. 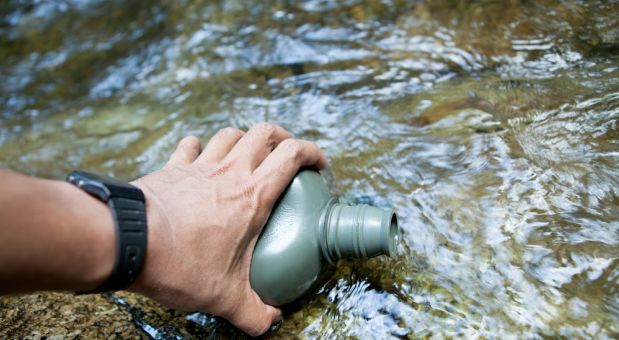 Check out your local camping store for a portable water purifier or purifying kit. They are straightforward to use and ensure the water you’re drinking is clean and safe to drink. In a world of technology, practical skills are often overlooked. But unfortunately, you can’t always rely on your phone to give you all the answers – what will you do if there’s no signal or the battery dies? There are some things that you should definitely learn before you venture out into the wild and we’ve created a list of them here. These skills are not only extremely useful, but are easy to learn and guaranteed to come in handy. Being able to tie a strong knot is essential to creating strong structures in the wilderness. If you’re building a shelter to keep you protected overnight for example, you will need strong knots to ensure your structure stays up in all weather conditions. Tying strong knots is also essential if you are planning to take hikes in mountainous terrain. When tackling a steep climb, it’s important to make sure you locate an anchor that can support you, and connect yourself securely to the anchor with some rope. Getting lost in an unfamiliar place can be extremely dangerous, especially if you’re in a remote area. 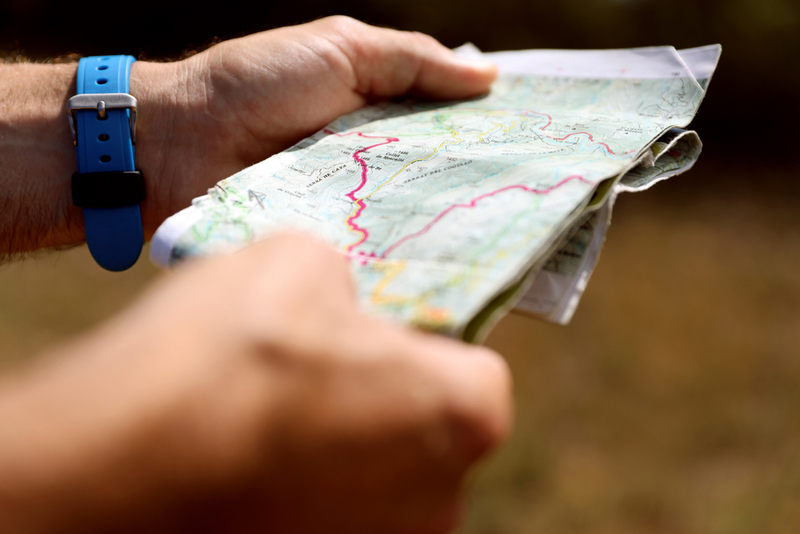 Map reading is an essential skill that everyone can learn. Before you set off on your expedition, find a good map of the area you are planning to explore, plan your route and make sure you know how to follow it properly. Once you’ve taught yourself how to map read, it’s important that you also know how to orienteer safely. This includes being able to plan out a route on a map, use a compass to find your way and navigate this route on foot. Usually when orienteering, you’ll break your route into sections by setting certain landmarks or areas to aim for. This will help you to stay on route. Decide on some catching features before you set off to look out for on your route. These will let you know if you’ve overshot your target. Also make note of some features or landmarks to look out for long the way to keep track of your location. Luckily, this is not as hard as it sounds. It is entirely possible to build a strong and secure shelter using only the natural materials around you. You can learn how to build a range of different shelters here. Being able to source and identity edible food in the wild is an essential skill. It’s essential when foraging for food in the wild that you check your food is safe to eat. One basic rule to follow is to avoid toxic areas such as road sides where plants might absorb toxic exhaust fumes and areas that might have been sprayed with pesticides. Teach yourself how to identify safe and edible sources of food. Natalie is a content writer for 4Ever Deck, a company that supplies a wide range of outdoor products such as decking, cladding and railings. 4Ever Deck is a company dedicated to supplying highly quality and long lasting garden products so that you can achieve any look you want with your back garden. We hope to inspire our customers by showing that there are endless possibilities in garden design. Whether it's through an amazing decking area or a Feng Shui garden plan, there's a perfect garden for everyone and we're here to help you achieve yours. For all who don’t know, “torch” is the United Kingdom name for flashlight. A GPS and solar charger are more luxury items than essentials and should be treated as such. 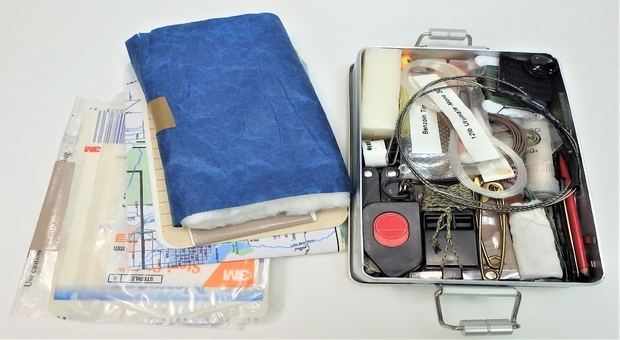 It’s best to primarily depend on old-fashioned low tech items like maps, compass and other such items. Does no one ever proofread the articles they write for these websites? Prepper sites seem to have the most ignorant writers, with the lowest level of education in the English language, of all web communities. And this includes British writers. 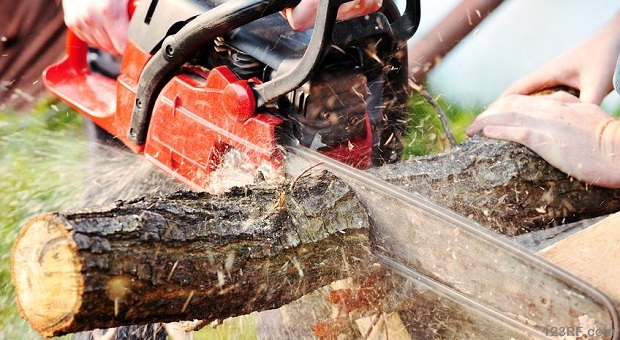 Survival skills are one thing but life skills – which are needed to survive before SHTF – are another. The correct English in your first sentence should read, ” Does anyone ever……….. Not Does no one! Actually, both are grammatically correct. A good skills book is a good old fashion boy scout manual or field manual. It gives a wealth of information. 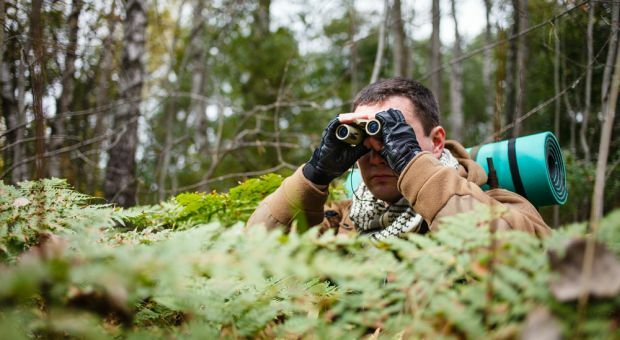 This is a good introductory article for people who lack experience in back country and wilderness survival situations. I would take a somewhat contrarian position to the comments submitted by Bob and Steve, although I understand where their point of view. Regarding GPS, if you have it, go ahead and use it; but with the caveat that you STILL need to know how to read a map and use a compass. 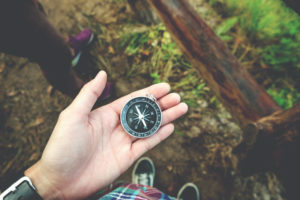 Once a person learns how to effectively use a handheld GPS device, there is no question that it is far more convenient and accurate for navigation. Of course a GPS unit is pricey compared to a good compass and you must consider its power requirements. It is just as important that you know the area you are traversing, whether it is a highway or as a cross country hiker. I would disagree with the recommendation of Mylar emergency blankets for improvised shelter, Quality tarps and ponchos have grommets which create strong tie down points. Moreover, tarps and ponchos generally have larger dimensions than Mylar blankets and can better withstand high wind conditions. Use the emergency blanket for what it was designed – prevention of hypothermia.